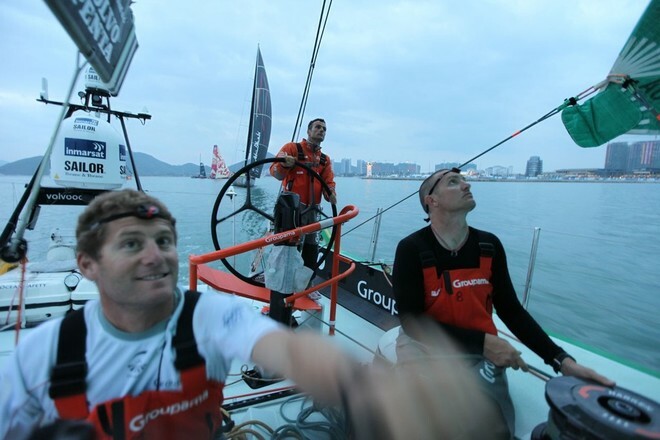 Volvo Ocean Race team Groupama 4 set off on leg four from Sanya at first light local time in the wake of the Spanish and quickly took control of the fleet on their way towards the North of the Philippines. On the programme is a 660-mile sprint to the Luzon Strait, across a rather ill-tempered South China Sea, with an easing breeze of around twenty knots and what are still heavy seas. It has been the year of the Water Dragon in China since 23 January 2012. This particular dragon belches out rain rather than fire, which is providing the land with moisture and enriching the harvest. For the six crews, who took a staggered start from 2300 hours (according to their result during the preliminary course in Sanya), their introduction to proceedings has also proved to be very wet… A light breeze was blowing as the sun rose in the East. Once the boat had got around the land masses that form the island of Hainan, the wind showed itself to be more consistent with around twenty knots of north-easterly on a somewhat lumpy sea. ‘The inside of the boat is wet and the foulies are soaked. Each time it’s a surprise to observe the total discomfort of these boats on these points of sail! However, the benefits are twofold: you make very fast headway, and particularly on Groupama 4. Added to that you only have to glimpse at the standing…’ wrote Yann Riou this morning. 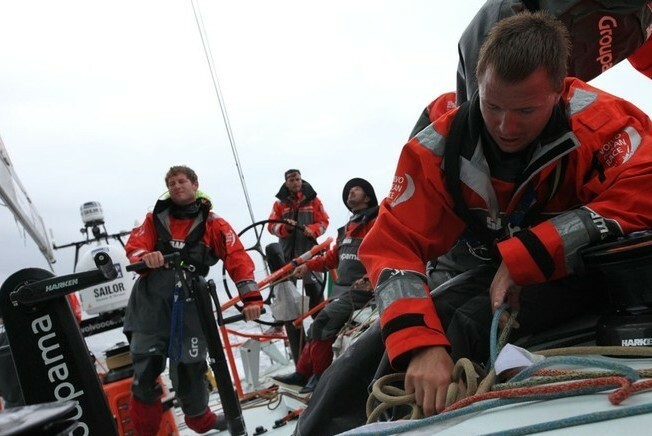 Indeed, after half a day at sea, the sailors haven’t adopted identical short term strategies: whilst Telefonica and Abu Dhabi, tailed a dozen miles or so back by Puma, were sailing high up to reposition themselves to the North of the fleet, Groupama 4 and Camper were lengthening their stride with sheets eased whilst Sanya was making a clean split, plunging down to the South-East! There is already a 25 miles lateral separation after covering just 130 miles since the start in Hainan… However, this first phase indicates that Franck Cammas and his men have negotiated this lively start well and are managing to contain the pressure from the New Zealanders, whose boat is renowned as being the best upwind. They will now have to adapt their tactics to a sky which will become overcast and squally, leading to sizeable wind shifts and appreciable differences in the intensity of the breeze.